In the seventeenth century, the Netherlands held a prominent position in Europe in the production of books, maps and prints. Not only were the number, diversity and quality of printed works renown, but also the "versiering" - the application of decorative graphic elements in the colouring of maps, prints, title pages, opening and closing vignettes, etc. Little is known about the many print and map colourists, the 'const- en caertafzetters', who lived in the Netherlands at the time. Three colourists are seen as the most important artists of that time: Frans Koerten, David Reerigh, and Dirk Jansz. van Santen. Since the work of a colourist was usually not signed, many have remained anonymous. However he most important exception on this was Dirk Jansz. van Santen to this rule is Dirk Jansz van Santen. Atlases and books coloured by Van Santen figured among the showpieces of the most prominent collections, such as that of the Amsterdam burgomaster Nicolaas Witsen (1641-1717) or of Laurens van der Hem (1621-1678), a wealthy Amsterdam lawyer. Bibles and atlases, bound in deluxe bindings by Albert Magnus (1642-1689) and decorated by Van Santen were considered gifts worthy of princes. Travelers and poets wrote about his work. There is a reference to him in the travel account of Zacharias Konrad von Uffenbach, Merkwürdige Reisen... (Ulm, 1750-54). Von Uffenbach was the burgomaster of Frankfurt and an art collector who left a record of his visit to Amsterdam in 1711 which makes it clear that collectors competed with each other to obtain the best of what Van Santen had made(3). Gelijk die fakkels aan de luchtstreek zijn gesteld. Al werkende, noch in van Zanten daaglijks groeit. The colours, the gold, the patience and industriousness of Van Santen were obviously of great renown at the end of the 17th century. Recently, H. de la Fontaine Verwey started to retrieve Van Santen's work. (5). In locating a number of atlases, Bibles and illustrated books coloured by Van Santen, he has laid the basis for further research. What follows is a summary of the current state of research on Van Santen's life and work, supplemented with new information and a description of his work method. Dirck Jansz van Santen was born in 1636/37 in Amsterdam. He was a son of Jan Jansz van Santen who is known to have been a member of the booksellers' guild as of April 29, 1651. Publications of Jan Jansz are known from the period 1656 to 1661'. In 1653 Jan Jansz bought a house on Oudezijds Kerkhof (now Oudekerksplein 54) for f 4,000. In other words, he was doing rather well. Not until January 6, 1675 do we find any reference in the Amsterdam archives to Van Santen as a map colourist. At that date, 'Dirck Jansen van Santen, kaartofsetter oudt 37 Jaren after de oude kerk', at an age of 37, he became engaged to Janneke Martens, a woman eight years his junior from Nijmegen. He was living at the time 'behind the old church', that is to say at the same address as his father, as was his betrothed (10). At that time Van Santen had probably been in Laurens van der Hem's employ for some years. That wealthy collector died in 1678. According to Uffenbach, Van Santen worked for Van der Hem '...viele Jahre lang vor sich allein in seinem Hause......(11). In addition to his extensive library, Van der Hem owned a famous atlas, based on the eleven-volume Atlas Maior by Blaeu (1662) and enlarged to 46 regular and 4 supplement volumes, totalling more than 2,000 maps, prints and drawings. It has been preserved until today. This atlas was one of the important attractions of Amsterdam, partly because of Van Santen's decoration. Among the eminent foreign visitors who came to look at it were the Medicis, the grand dukes of Tuscany. They offered f 30,000 an enormous sum at the time, for the bound portion of the Atlas (33 volumes), but to no avail (13). Such a sum does not reflect Van Santen's income, we should note; it is unlikely that he earned much more than a normal craftsman (14). How long Van Santen worked for Van der Hem is not clear. It is possible that after Van der Hem's death in 1678 he worked for the widow, who died in 1697, and then for their daughter Agaath (died 1712). There is no documentation on how Van Santen organized his work after his period with Van der Hem. The most likely hypothesis is that he ran a print shop himself and sold his coloured maps and prints directly. His membership in the Amsterdam Sint Lucas guild, in which he is mentioned in 1688, also points in this direction (15). At the same lime, Van Santen may have had a regular working arrangement with one or more publishers/booksellers for whom he did the colouring of illustrated books. This is suggested in the research undertaken by W.K. Gnirrep into the possible connection between Van Santen and the writer/publisher Willem Goeree (1635-1711) (16). Gnirrep did not find any concrete evidence for the Goeree-Van Santen link, but his research did reveal that between about 1683 and 1690 Van Santen illuminated folio Bibles with the help of model prints. Using model prints, he could produce identically coloured prints at different times, if that was what a publisher asked (17). It is also possible that in addition to Goeree, the map publisher Johan van Keulen was a regular customer of Van Santen. Van Keulen purchased a large share of Blaeu's material after the latter's death. When Van Keulen died in 1689 there was an item among the outstanding debts to a certain Dirk Jansse of f 30 (18). Was this Van Santen? It is not inconceivable that after his employ with Van der Hem, either directly thereafter or at a later stage, Van Santen not only had his own print shop or a regular relationship with one or more publishers, but that he also worked privately for an Amsterdam collector. Those who seem most likely as employers are Willem van Beest and Jacob Cromhout because of their large collection of Van Santens. According to the advertisement for the auction of his library (Amsterdamse Courant, March 3, 1714), Willem van Beest owned dozens of books and prints illuminated by Van Santen (19). At the end of his life, round 1709, Jacob Cromhout could count at least 32 atlas volumes and map books coloured by Van Santen (found in 13 catalogue numbers), most of which were in folio format (20). Research on Van Santen collectors such as Cromhout and Van Beest might reveal more information about the colourist. In 1684 we find reference to Van Santen in the notarial archives of Amsterdam. In 1684 he was feeling ill enough ('sieckelijck') then to have a will drawn up for himself and his wife; on November 27, 1684 they appeared before the notary Pelgrom Blok (21). Their only son, Jan, baptized on August 22, 1683 was named sole beneficiary with the exception of the Orphans' court. On December 12, 1687 a daughter was baptized. On November 11, 1688 a child was buried; the name of the child is not given, however. Since no further references to the son Jan Dircks are found, it is possible that he was the child who died. The only other information about Dirck Jansz van Santen is that he died on May 23, 1708, well over the age of 70, and that he was buried in the Leidse Kerkhof in Amsterdam. This we know from an invitation to his funeral found in a large folio Bible of 1682. Unquestionably this Bible has been illuminated by the deceased himself (22). On the funeral invitation, Van Santen is called a 'Master Colourist' (Meester Afsetter), a title which is not frequently used in connection with this profession. His art had brought him renown and fame but not wealth; the tax office declared him to be without means. In 1724, approaching the age of 80, his widow sold the house on Oudekerksplein for f 3,000 perhaps to go to an old people's home. The official sale took place on March 17. It has not been pointed out until now that an anonymous auction more than three months earlier (November 16, 1723) may have a connection with Jannetje and her move to a smaller dwelling. Among the things offered for sale were 'veel rare en konstig afgezette Kaerten' by Van Santen, 'eenige Modelle' - model books or prints - , 'eenige Schilders gereedschappen en een schoone Vryfsteen'. Jannetje Martens seems the most obvious person to have had possession of Van Santen's work materials, such as his grinding stone and model books or prints. Unfortunately, catalogues from this auction have not been found as yet (23). Jannetje Martens outlived her husband by 21 years. She was buried on October 6, 1729 in the Leidse Kerkhof, having lived on Keizersgracht between Molenpad and Runstraat. She was also declared insolvent, by Jacobus Flier (born in 1703 as Jacob Thielmans Flier). According to the burial register of the Orphans' court she left behind a minor grandchild. Any other descendants, the son or daughter, had presumably died. The trail of Van Santen's descendents stops here, at least as far as we know at the present. It may possibly be sought in the catalogue of the 1723 auction, which still remains to be found, and in the Bible which contained Van Santen's funeral invitation (and in which the personal details of other families such as the Veenings and Clockeners are also included written in or bound along with the Bible). 'Op 't aldersehoonste afgeschildert..,' 'sindelyk en raer afgeschildert', 'met onvermoeyelijcken arbeyt en grote kosten op 't aldersehoonste afgeschildert'. Van Santen's contemporaries exhausted themselves in praise for his work. What made Van Santen's colouring so distinctive? His use of colour was much freeer than that of other colourists. The tone of the colours was made to complement the gold he used so lavishly. In his best work two other costly pigments, ultramarine and carmine are found in large amounts, mostly set against gold. Ultramarine and gold were a very popular colour combination in the seventeenth century. Van Santen combined the colours in a somewhat impressionistic, vivid manner. He avoided monotonous, monochromatic, dull surfaces and lines. Characteristic of his style is a variation of colour, also of borders and edging for both maps and illustrations. Moreover, he added elements to the design, such as patterns and flower motifs to the clothing of figures, veining of stones or map frontier lines. He gave the frontier lines a decorative treatment in the map as a whole by means of placement and by colour. He would use two or three striking colours next to each other, e.g. red, yellow and light green, sometimes accentuated by a fine golden line. Van Santen applied transparent and opaque colours at the same time in both mixed and pure tints. He often painted the whole surface of the map or illustration, transforming the graphic light and dark into colour. To dark areas representing shadows, clothing pleats or the 'repoussoir', the foreground of a landscape, he applied his characteristic shiny varnish; this had the effect of brightening the dark colour. He devoted a great deal of attention to skies and horizons, frequently making use of the same colour progression. This entailed a blue sky with a great deal of opaque white, moving to pink with opaque white, and then to very light yellow with light green elements, finally to the mountain tops which in the distance are blue with a bit of pink-shaded white. For the light and dark effects of the ground he used browns, greens and the white of the paper, either heavy or transparent colours depending on the engraving. Less and less white is mixed with the colours as the foreground comes closer, and shadows in the foreground are treated with a heavy varnish. Inserted prints and maps were normally cut out along the engraved border and pasted very precisely on paper of the same format as the book they were to accompany (Bible, atlas). By using a golden or yellow inside border and a red outside border along pencil lines next to the cutting edge (often a brightly coloured and gilded border scale of longitude and latitude) he obtained a decorative transition between print and underlying paper that was hardly visible. During his best period, Van Santen was very careful and exact in this; less fastidious borders in which the colours run outside the pencil line are not unknown, however, particularly in his later work. Above al things Van Santen distinguished himself from his contemporaries in his lavish use of gold which he applied meticulously. On maps he applied gold not only to the decorative motifs, the legends, cartouches and coats-of-arms, but he also worked it decoratively into the map itself. He used gold for the dots representing cities; he sometimes used gold for the names of regions; and occasionally he added gold lines to the frontiers of countries or to the outlines of islands. He did not hesitate to introduce his own inventions, that is to say elements which were not on the engraving, such as gold stars and clothing motifs. Not only were the prints and maps gilded but frequently also the table of contents, printed decorative borders or floral ornaments, title pages, initials, opening and closing vignettes, etc. The fact that Van Santen's use of gold made his work very desirable to his contemporaries is evident in the travel report Uffenbach made of his visit to see the Atlas Blaeu-Van der Hem in 1711 (25). 'gerissen und beschricben dabey, alle ungemein schön und kostbar. 'Meister Dirck Janssen van Santen, so nunmehro tot isst. 'war die Beschreibung sehr sauber dazu gemacht und geschrieben. 'wie die andern Blättem versehen [d.J.D.v.S.]. (...). Whether this breviary was decorated by Van Santen is not immediately clear from the catalogues which have been preserved. It is interesting to note that in Van Santen's time the use of gold leaf, which had to be cut and pasted, was considered old fashioned. Van Santen may not have used gold leaf, but what Uffenbach calls 'Muschel Gold', 'shell gold' as it was called in the seventeenth century. The name refers to the practice of storing the gold pigments in a shell. Much of this was imitation gold, made from copper, tin, and the like, but the finest quality was made from finely ground gold leaf. Gold leaf was available in small booklets of approximately 5 x 5 centimetres containing a number of very thin sheets of gold. A 17th century method of making shell gold from gold leaf was to grind it on a rubbing stone along with honey, water and salt and then to wash it in very clean water. The small amount of liquid gold was then placed in a shell and vinegar was added to it. The vinegar assured a good consistency'. Needless to say, this high quality shell gold was very expensive and must have been paid for by the customers of large, prestigious projects, as in the case of Van der Hem. Seventeenth century instructions for applying gold to paper have been preserved and give an indication of the complexity of this treatment. In all likelihood, Van Santen had developed his own method for applying gold to paper. As far as one can tell with the naked eye, he first put on a yellow base before using a brush to apply the gold. Scientific tests might make it possible to determine more about Van Santen's characteristic use of material, particularly about his use of gold. This could make it easier to identify his work. The question remains of when and to what extent Van Santen used a particular method, technique or type of materials during his forty year career. The fact that his work was not always of the same quality seems to be indicated by Agaath van der Hem's remark that her copy of the Courses de Testes et de Bague (the Carrousel ) was one of the best copies Van Santen had ever made. Goswin van Uilenbroek thought that his 'Royal Copy' of the Carrousel had more right to this title. Uffenbach ultimately cast his vote for Agaath van der Hem's Carrousel (27). Fontaine Verwey is of the opinion that Van Santen coloured atlases in three different ways: colouring without gold; gold just for the legends, cartouches, coats of-arms and decorative motifs of a map; and gold on the maps themselves, for frontiers, cities, etc.'. Based on this, it would seem obvious that Van Santen used the first and second methods mostly in the beginning of his career when he, as one of many colourists, had to make use of his own, doubtlessly meager, supply of gold. This would offer a possible explanation for the fact that little gold was used for Nicolaas Witsen's Blaeu atlas, which must have been decorated about 1665. In the seventies and later Van Santen used a great deal of gold, as we see in the Atlas Blaeu-Van der Ham and in the four Bibles listed below'. A good example of Van Santen's work during the last days of his life may be found in Van Loon's Nieuwe Zee-Atlas dated 1706 and currently located in the Municipal Archives of Haarlem'. Almost everywhere the colouring goes beyond the borders of the illustrations (in contrast to the period in which the Bibles were coloured, about 1680-1690) as do the gold decorations. In each case, the dots for the cities are found next to the circle place designations instead of in the middle of them. There is still a liberal and lavish use of colour, but sometimes small areas have been painted thickly so that they have lost their clarity. The colours are somewhat coarser and harsher but still with effective accents. The whole surface is no longer painted and large areas of the paper are left blank. Which atlases, maps, books and prints did Van Santen colour? The answer to this question is complicated by the fact that Van Santen, just as all other graphic colourists, did not sign his work. Consequently, it is difficult to offer incontestable proof of the authenticity of his work. Identification is made in the first place on the basis of contemporary information, supported by stylistic characteristics. Fontaine Verwey carried out pioneering work in this area, followed by W.K. Gnirrep (31). As a result, a number of atlases, Bibles and illustrated books has been ascribed to Van Santen with a great amount of certainty. This offers a foundation for further attributions. 1) Van Santen's greatest achievement, the above-mentioned fifty-volume Atlas Blaeu Van der Hem has been preserved in its entirety, especially due to the fact that Van der Hem's descendants were only willing to sell it as a set. Van Santen illuminated all the prints in this atlas and fit them to the large folio format of the Atlas by means of cutting, pasting, folding and painting. The materials, the gold and pigments, were paid for by Van der Hem. Van Santen worked on this Atlas in the seventies or thereabouts, a fact which was recorded by Uffenbach and by an auction catalogue of November 20, 1730 (Moetjens, The Hague). At the time of Uffenbach's visit in 1711, he found only 43 volumes, 33 of which were bound. It may be assumed that Van Santen was responsible for the decoration of these bound volumes. He may have coloured the prints from the other seven volumes as well. After Van der Hem's death (1678) and that of his widow (1697), the Atlas belonged to their daughter Agaath. She remained actively involved in its presentation, design and perhaps even completion until her death in 1712. In the front of volume five there is a signed and coloured coat-of-arms from her hand; it bears a swan, the emblem of the Van der Hem family, and is dated July 17, 1676 (32). The Van der Hem family sold the Atlas in 1730 for f 22,000 to Prince Eugenius of Savoy; at that time it consisted of 46 volumes and four supplements'. After Eugenius' death, his library was purchased by Kaiser Karl VI in 1737 and moved to the Hofbibliothek in Vienna, now known as the Nationalbibliothek, where the Atlas is still now-a-days. The atlas may no longer be examined but a facsimile is in print. 2) Lambert Hortensius, Van den Oproer der Wederdooperen. Enkhuizen 1624, and C.van Sichem, Histoilsche Beschrijvinge ende Afbeeldinge der voornaamste Hooftketteren ( .. ), waarbij gevoegd zijn de groote portretten van Jan van Leyden en B.Knipperdollingh, naar Goltzius, benevens de portretten van F.Socinus, J.Slichting en Jde Labadie. In addition to the grand Atlas, Laurens van der Hem possessed a large collection of books and prints, the greater part of which went under the hammer in 1684 (35). More than 20 items, almost all of them deluxe volumes of plates, were announced as having Van Santen's 'seer raer en ongemeen braef' paintwork! So far, only one of these items in the auction catalogue has been found; it was described as 'De Naeckt-loopers en hooft ketteren van Nederlandt en t'Amsterdam/ konstigh afgeschildert door Dirck Jansz-van Santen' (Hem 1684, IY. 66, no. 22). A copy which fits this description is found in the University Library of Amsterdam and was ascribed to Van Santen by Fontaine Verwey even before the Van der Hem catalogue was found; one of the reasons for this was an inscription on page Aij verso, next to the coloured final vignette of the dedication which reads 'afghezet door D. Jansz van Santen N.I.'. According to an 1828 catalogue description there were two such volumes, containing a combination of two older books and some separate portrait engravings, coloured by Van Santen (36). The illumination is exceptionally lavish. A great deal of ultramarine, carmine, vermillion and gold was used for the portraits in large, opaque surfaces, sometimes heavily varnished. In the first book Van Santen coloured and gilded the title page, the legends above the two dedications, the initials, the fleurons and nine engravings portraying the fortunes of the Anabaptists. In the second he coloured the printer's borders and all of the portraits". 3) The Atlas van Hadrianus Relandus, Meermanno-Westreenianum Museum, The Hague. This 19-volume atlas in large folio format was purchased by Gerard Meerman in 1761 from the Relandus family. It contains Blaeu's ll-volume Atlas Maior as well as his seven Stedeboeken (five Italian and two Dutch, all in a Latin edition) and the 1676 Dutch Zee-atlas ofte water-wereld by Pieter Goos. In a note which has been preserved, Meerman wrote that the atlas was purchased from the Blaeu's for f 2,000 as a present for the orientalist Hadrianus Relandus. According to Meerman, the value of the atlas was to a great extent due to the 'artifex eximius Theodorus van Santen'. Van Santen illuminated this large atlas exceptionally carefully and lavishly. He worked on every sheet, using gold on the maps, the title prints, printed titles, initials, coats-of-arms, etc. The colours were for the greater part applied transparently (38). 4) Hendrick Laurensz Spiegel, Hertspieghel, Wetstein, Amsterdam 1694. An old note on the end leaf says that this copy belonged to the estate of Willem van Beest and has coloured plates by 'Dirck Jansz van Zanten'. Willem van Beest was a great Van Santen collector, as is clear from the advertisement for the auction of his estate (Amsterdamse Courant, March 3, 1714). In the Hertspieghel, Van Santen coloured the engraved title page, the title print, the portrait of Hendrik Spiegel, two large fold-out prints, including the Tabula Cebetis and eight emblematic illustrations accompanying the 'Verderfs-traps beeldschrift"'. (private collection). 5) Bijbel, dat is de gansche Schrifture..., J. and H. Keur, Dordrecht, M. Doomick, Amsterdam, 1682. This 'Staten Bijbel' (the authorized Dutch version) in large folio format is found in the University Library of Amsterdam. It has Van Santen's funeral invitation pasted in on the first end leaf. It contains six maps engraved by Bastiaen Stoopendaal after Danckerts. In addition, numerous prints and maps have been inserted into this copy, all of them indisputably coloured and gilded by Van Santen'. In addition to lavishly illuminating the maps and prints using gold for the cartouches, embellishments, frontiers of countries, cities, islands, etc., he also gilded the legends of the explanatory text on the back and the opening initials and closing vignettes. Given the dating of the prints, the Bible must have been put together and bound after 1690, which suggests that Van Santen carried out his colouring work at about the same time". 6) Bijbel, dai is de gatuche Schrifture .... J. and H. Keur, Dordrecht, M. Doornick, Amsterdam, 1682. This large Kcur Bible, which is found in the library of the Koninklijk Oudheidkundig Genootschap (KOG) in Amsterdam also contains a great number of inserted and richly illuminated prints and maps. Some are identical to the above-mentioned Bible. The KOG Keur Bible must have been put together and bound in 1683, as W.K. Gnirrep demonstrated, which indicates that Van Santen must have been working on it at about the same time. Since the related prints in the two Bibles are almost identically coloured, despite a time difference of seven years, we conclude that Van Santen must have made use of model prints'. 7) Bijbel ( .. ), Elzevier, Leiden, 1663, 2 volumes (Old and New Testaments) bound by Albert Magnus. In this 'Staten Bible' in large folio format (University Library of Amsterdam) there are a number of inserted prints coloured almost identically to those in the KOG Bible. This establishes that Van Santen was the author as well as the fact that model prints must have been used'. 8) Bijbel, dat is de gansche Schrifture .... J. and H. Kcur, M. Doornick, Dordrecht/Amsterdam, 1686. This Keur Bible, housed in the University Library of Leiden is the most lavish of the four Van Santen Bibles known today. This holds not only for the number of inserted prints and maps but also for the colouring. In addition to the prints, all of the initials and vignettes are coloured, which in the other Bibles was true for only some of them (44). The more than twenty prints which this Bible has in common with at least one of the other Bibles have been coloured following the same model. 9) Joannes van Loon, Nieuwe Zee Atlas, Van Waesbergen, Amsterdam (1706?). The first edition of Van Loon's Klaer Lichtende Noort-star ofte Zee-wlas appeared in 1661. This late and greatly augmented edition of the Zee Atlas is preserved in the Municipal archives of Haarlem and contains fifty maps. Inserted but not included in the binding is a 28-page printed description of the atlas with an engraved title print by P. Medina and E. Wright. In the empty cartouche we find written in black and gold calligraphic letters 'Nieuwe Zee Atlas. Afgezet door Dirk Jansz. van Zanden 1706' (45). Van Loon's Zee Atlas from Haarlem is the latest known work to have been coloured by Van Santen; in 1706 he was 69 years old. His age explains a number of stylistic differences with the above-mentioned works. The colouring is less fastidious and fine, the use of gold less precise. In contrast to the Bible maps, the gold dots representing the cities are hardly ever in the centre of the engraved circles. There is an ll-volume Blaeu atlas found in the University Library of Amsterdam (UBA) in a cabinet from about 1665'. Fontaine Verwey presumes that it belonged to Nicolaas Witsen (1629-1717). It is found in Witsen's auction catalogue of 1728 described as 'een Kabinet met een Atlas van Blaeu, 9 deelen, benevens 2 Steedeboeken, door D.S. van Santen, curieus afgeset' (p. 15). Its composition corresponds to that of the atlas in the UBA. However, unlike all other known Van Santens, it has almost no gold aside from the title prints. If the atlas in the UBA is the same as that listed in Witsen's catalogue, the colouring probably dates from the beginning of Van Santen's career (approx. 1665) when he would have used less gold for financial reasons. 11) Atlas Minor, composite atlas in large folio format from the beginning of the 18th century. Antiquariat Paulus Swaen has sold in the past a handsomely coloured and gilded Atlas Minor. This composite atlas is in large folio format from the beginning of the 18th century. The atlas contains a title print by Romeyn de Hooghe, hand written index with 128 titles, 80 maps, and 2 plans by Joan Blaeu, N. Visscher, Frederick de Wit and Carolus Allard among others, and one portrait. 44 Prints, many of them probably by Romeyn de Hooghe, have been removed. On several grounds it may be assumed that the illumination is by Van Santen. The maps are lavishly coloured using gold and silver for the cartouches and further embellishment, the country frontiers, cities, islands, names of regions, etc. The style is comparable to that of Van Loon's Zee Atlas in Haarlem, but makes greater use of colour, gold and silver. All 128 titles in the index, for example, are written in gold letters, combined with black ink. The borders around the maps are frequently triple and include a scale of longitude and latitude; the variation in tone and colour from red and blue-green alternating with gold yields a lively effect. The figures around the cartouches are painted in a somewhat impressionistic way that is characteristic of Van Santen, with many contrasts, the colours set against each other very effectively. Varnish is used for the dark shadow areas to highlight the colours. Small gold lines which diverge from the engraved line are added to the frontiers. Gold dots indicating the cities are not very accurately placed in the engraved circles. The coloured borders of the map have not been applied all that carefully. Such imprecisions are also found in the Van Loon Zee Atlas from 1706. The atlas has an allegorical title print by Romeyn de Hooghe which was originally used in Jaillot's Atlas François of 1696 (47). This title which was included in the lower cartouche disappeared, however, under a brown layer of paint. It was not unusual for Van Santen to cover up titles with paint to make it possible to use the print for something else". The address of Covens and Mortier has been erased from the plate. The maintained title, originally Atlas Novus( .. ), has been changed to Atlas Minor ( .. ). An Atlas Minor coloured by Van Santen is found in contemporary sources. In the auction advertisement of the above-mentioned collection of Willem van Beest (Amsterdamse Courant March 3, 1714) there is a reference to 'een Atlas Minor,' '(... ) ongemeen konstig en met goud doorwrogt afgezet van den vermaerden Dirk Jansz van Zanten"'. It is possible that these copies are one and the same. The atlas was sold at the time to a US dealer and was, sadly, then broken up ! Auction catalogues are important sources for reconstructing Van Santen's work. As a result of Van Santen's great. renown his name was regularly mentioned in the catalogues of book and 'papierkonst' sales; this was not the case for his fellow colourists. The earliest reference is from 1684, when the Van der Hem library was auctioned off. The descriptions in catalogues offer the best source for tracking down Van Santen's customers and collectors and for gaining a general picture of his activities. There are not always catalogues available, however, of the many sales of estates, art and book collections in the 17th and 18th centuries, either because they were never made or have been lost. An important addition to the auction catalogues are the advertisements in newspapers of these auctions. The presence of Van Santen's work round 1700 was an indication of the quality of the sale in question, so that, in contrast to his fellow colourists, his name and work were often used even in the small newspaper advertisements. Van Santen's work has been found in libraries and print collections of the following collectors: Comelis Nicolal (Amsterdam 1698), Hendrik van Beest (Amsterdam 1704), the famous binder Albert Magnus (Amsterdam 1707), Jacob Cromhout (Amsterdam 1709), Dirk van der Hagen (Amsterdam 1710), H.A. van der Marck (The Hague 1712), Willem van Beest (Amsterdam 1714), Petrus Deynoot (Rotterdam 1728), Goswin Uilenbroek (Amsterdam 1729 and 1741), Isaac Clockener (Amsterdam 1758), Valerius Röver (ms., Delft ca. 1740) and Jan de Kommer (Amsterdam 1767), aside from the already-mentioned collections of Nicolaas Witsen (Amsterdam 1728), Laurens Van der Hem (Amsterdam 1684, The Hague 1730) and Joan Bus. In 1718, 1720, 1723 and 1740 Van Santen's work was used to advertise four anonymous auctions'. A look at the catalogues makes clear that the owners of work coloured by Van Santen were for the most part well-to-do collectors of books, prints and frequently also of paintings. In most cases their collections included more than one work by Van Santen. Atlases were often the heart of a collection, particularly the multi-volume atlases by Blaeu, frequently accompanied by 'toevoegselen' that is with other maps and prints or additions from other atlases. Not only in the Van der Hem collection was the Blaeu atlas decorated by Van Santen the showpiece of the collection, but also in those of Magnus, Cromhout, Witsen and Van der Hagen. Other atlases coloured by Van Santen were also in circulation; these included the atlases of Janssonius, Cellarius, Sanson and Goos. Van Santen must have also coloured and sold individual prints and maps. Apart from the individual maps offered at the anonymous auction in March 1723 this is shown for example in an advertisment of 1758, mentioning 'een weergalooze collectie van gebonden en losse Prentwerken, waar van eenige in vergulde lysten, synde het grootste getal afgezet door den vermaarden D.J. van Zanten' belonging to Isaac Clockener. The descriptions in the catalogues underline the opulent character of Van Santen's work. The lavish use of gold and costly colours such as ultramarine and carmine which made Van Santen's work renown was apparently not normal practice in illumination. Probably the purchase of such materials was too costly. Below is a survey of the references to Van Santen's cartographic work in old collections known to date (1992), accompanied by extensive quotations. This is followed by a list of other titles which have been found. Some of the atlases named have been preserved but most of them have not yet been identified or have been lost. Since the research into Van Santen's work is only in a beginning stage, the chance is great that a number of other works will come to light. After the fifty-volume Atlas Blaeu-Van der Hem which we discussed above under 'Work identified as Van Santen's', the first set of works which must be mentioned are those belonging to the Amsterdam collector Jacob Cromhout. He seems to have wanted to equal Van der Hem's collection both in quantity and in quality. In addition to a collection of more than 200 paintings, he had an exceptional collection of atlases and map books, a large portion of which had been illuminated by Van Santen. For the auction of his collection (dated April 19, 1709), a special appendix to the catalogue was printed for the atlas collection. This Catalogus van Atlassen, Stede-boeken, Boeken met kaarten, ppinten en figuren.... has never been examined in connection with Van Santen. In the middle of the many 'curieus' coloured works there are no fewer than thirteen items which mention Van Santen. The foremost entry (no. 1) is an 18-volume Blaeu atlas-factice, an 'uitstekende Atlas, van Blaeu, Nederduits / in 18 stucken,. behelsende behalven de ordinaris Atlas-kaerten / noch daer en boven de meeste aldernieuwste kaerten / en veel treffelyke konst-printen, bestaende in alderhande Verbeeldingen / van Personagien / kryg- en Staetsbedryven en gesichten van Plaetsen: in 18 Banden groot Atlas Papier / seer uitstekent kostelyk gebonden / en over heerlyk met Gout / karmyn en Ultramaryn afgeset / door Dirk Jansz.van Santen, daer van geen weerga is'. Furthermore, there were 'door den zelfden van Zanten kostelyk afgeset' a 'Fransche Atlas van Sanson, 2 voll. '(2), and a 'Neptune François of Zee-Atlas van Sanson'(3), both 'met seer veel byvoegselen' and bound in red leather; the 'Atlas Coelestis of Harmonia Macrocosmia Cellarii'(4); 'the Atlas of oude Wereldbeschryvinge van Janssonius (5); the Waterwereld of Zee-Atlas van Janssoniu.s' (6); the 'Waterwereld of groote Zee-Atlas van Goos, 2 stukken' (7); the 'Atlas of nieuwe Zee-spiegel' van Goos (8); and five prints 'Atlas wyze gebonde', including once again the Caroussel of Louis XIV (18), and 'Oxonia Illustrata', a description of Oxford accompanied by prints. Volumes of plates bound like an atlas such as these, often accompanied rnulti-volumed atlases as illustrations. Dirk Van der Hagen, about whom nothing is known outside of references to him in the advertisements, had a collection which was auctioned off and included a vierdelige Blaeu-atlas, 'ongemeen konstig met goud &c overschildert van D. Jansz. van Zanten, nooit so gesien (... )'. In addition, Van der Hagen owned 'andere Boekjens en losse printen' by Van Santen (advert. dated October 11 and 28, 1710)51. The estate sale of the widow of Albert Magnus, the famous bookbinder, also included a grand Blaeu atlas. For sale were 'veel schoone Atlassen en Stedeboeken van Blaeu in verscheydene Talen, waer onder een seer heerlyk door Dirk Jansz van Santen alfgezet, en 19 deelen Latyn, de weerga van Blok ( .. )' (advert. dated February 8 and 12, 1707). This atlas was identified by Fontaine Verwey as the series of 19 exquisitely coloured volumes housed in the Museum MeermannoWestreenianum in The Hague, the Atlas van Hadrianus Relandus (nr.3). The volumes were purchased for f 415 in 1761 by Gerard Meerman from the son of the orientalist Hadrianus Relandus. In a note which has been preserved, Meerrnan wrote that the atlas was purchased from the Blaeus for f 2,000. Although Meerman does not mention this, Fontaine Verwey is of the opinion that this purchase was made from the estate of Magnus' widow. Both cases concern a 19-volume, Latin atlas. The atlas in Museum Meermanno was probably not bound by Magnus, however, and contains a Dutch section (Goos' Zeeatlas)". There were more 19-volume Blaeu atlases coloured by Van Santen in circulation. Six years after Meerman's purchase in 1767, another 19-delige atlas van Blaeu coloured 'extra fraay' by Van Santen and having belonged to Jan de Kommer was auctioned off (advert. dated April 14, 1667, auction April 15). It cannot be determined at the moment how closely related the atlases of the Magnus, Relandus and Jan de Kommer families may be, due to lack of detailed descriptions (the catalogues for the Magnus widow and Jan de Kommer sales have not been recovered). At the sale of 'papieren konst' by H.A. van der Marck (The Hague, October 31, 1712), a fourteen-volume atlas decorated by Van Santen was sold, containing the eleven-volume Atlas Maior van Blaeu en drie atlassen van Janssonius. Willem van Beest was an art collector who possessed a large number of Van Santens (auction advert. March 3, 1714) including the above-mentioned Hertspieghel by Hendrick Laurensz Spieghel (not mentioned in the advertisement),'een Atlas in 4 deelen, een Atlas Minor', a number of volumes of the Cabinet du Roy, Bibles, emblem collections and historic works (... ), 'alle ongemeen konstig en met goud doorwrogt afgezet van den vermaerden Dirk Jansz van Zanten, nooit so gezien, (... )'. Unfortunately, the catalogue of this collection has not been found to date. The Raket agents in Amsterdam auctioned an anonymous estate in 1720 which included 'een curieuse Atlas van Blaeu in 11 Folianten, cierlyk afgezet door J. van Santen'. Nicolaas Witsen owned a cabinet which had been specially made for an elfdelige Blaeu-Atlas, consisting of a nine-volume 'Grooten Atlas' and two Dutch Stedeboeken, 'door D.S. van Santen, curieus afgeset' (cat. March 30, 1728, p.15). Moreover, the previously mentioned unknown collector Joan Bus counted an 'Atlas' coloured by Van Santen as one of his showpieces and Goswin van Uilenbroek possessed a celestial atlas coloured by Van Santen (cat.1741, p.28). In all there are about 150 atlas volumes named here, which make up 20 single and multi-volume atlases. Van Santen's other work, from Bibles to drawings by Pieter Holsteyn. In addition to atlases and maps, Van Santen coloured many other books during his forty year career; these included Bibles, volumes of plates and print series (portraits, triumphant entries, funerals), heraldic works, emblem and poetry collections. The albums containing print series were often compiled by the owner (recueils factices). 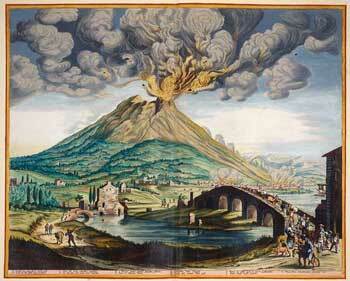 It is not generally known that Van Santen coloured drawings as well as engravings. In the 1730 catalogue of Van der Hem's books, p. 62, no. 720, we find reference to an album of 79 drawings of water birds by Pieter Holsteyn (ca. 1614-1687), coloured by Van Santen ('Aves Aquatiles ad vivum eleganter depictae a Petro Holsteyn, cet ouvrage est de la demière propreté, tant pour l'exactitude & netteté des dessins & ses coulours, enluminées par van Santen, que pour la conservation No. 721 (p. 63) is 'Aves ad vivum depictae a Petro Holsteyn, celeb. Pict., 104 dessins, enluminés par van Santen.' Coloured drawings by Pieter Holsteyn (ca. 1614-1687) are found in large numbers in Van der Hem's collection but no mention is made of any contribution by Van Santen'. For this reason it may be assumed that the descriptions are accurate. It is possible that Holsteyn also had been commissioned by Van der Hem and his descendants and that these drawings were 'finished' by Van Santen after Holsteyn's death in 1687. What follows in brief are all the descriptions of titles as they have been found to date (1992) from old auction catalogues, with the exception of the cartography and drawings cited and discussed more extensively above. A number of references most likely alludes to the same book which passed from one collector to another. It is not clear in all of the references which book or print series is meant; this is the case for 'Emblemataas' or 'Historien', for example. Nevertheless, these references have been included for the sake of completeness. Various books or print series which are mentioned as 'volumes of plates' are mentioned as separate titles (but from the same source). The books are grouped by type as much as possible; the categories we use are cartography (see above), theology, heraldry, plates and print series and other works. Clarification of the titles is given in brackets, the sources are given in parentheses. Bibliographical details are not given as yet, nor has an attempt been made to complete the catalogue descriptions. Further bibliographical research will reveal more about Van Santen and his work. Ovidius' Metamorfosen with prints by Diepenbeeck (Hem 1684, p. 64, no. 9); Batimens de France (Hem 1730, Atlas suppl, vol. I (47)). It is clear that colouring atlases was Van Santen's primary occupation, followed by the decoration of print books and print series. In addition, Van Santen regularly illuminated Bibles with inserted prints, and to a lesser extent, illustrated books of various topics, such as classical and contemporary poetry, gardening, astrology and history. The old references to Van Santen's works runs to more than 200 atlas and book volumes. If we take into consideration that Van Santen worked on some very exclusive volumes of plates for a whole year and also that his career spanned approximately forty years, this number could approximate the total number of works he illuminated. Up until the end of his life, Van Santen illuminated and gilded the most prestigious printed works of his time in an exceptionally painterly and brilliant manner. In so doing he made the Golden Age quite literally golden. 1. See in connection with this T.Goedings, "Kaarkicurders en de technische aspecten van het kleuren in de zestiende en zeventiende ceuw", in J.F.Heybroek (ed. ), Kunst in Kaart, Amsterdam 1989, pp. 94-129. 2. H.de la Fontaine Verwey was the first to gather material about Van Santen and his work, most notably in "The Glory of the Blaeu Atlas" and the "Master Colourist", Quaerendo XI (1981), pp. 197-229. 3. Z.K. von Uffenbach, Merkwüdige Reisen durch Niedersachsen, Holland und Engelland, 3 vols., Ulm 1750-1754, vol. 3, pp. 600-606. 4. Cited from W.K.Gnirrep, 'Dirk Janszoon van Santen en cen liefbebber der Joodse oudheden', Jaarverslag van het Koninklijk Oudheidkundig Genootschap, 1986, pp. 51-64, after findings of Marja Keizer. See also: M.Daamen and A.Meijer, Catalogus van gedrukte Nederlandse gelegenheidsgedichien uit de 17de en 18de eeuw in de Zeeuwse Bibliotheek te Middelburg. Middelburg 1990, no. 166. 5. Fontaine Verwey, op.cit. (note 2). 6. J.A.Gruys and C.de Wolf, typographi & bibliopolae Neerlandici usque ad annum MDCC Thesaurus. Nederlandse boekdrukkers en boekverkopers tot 1700 met plaatsen en jaren van werkzaanheid. Nieuwkoop 1980, p. 79. 7. See U.Thieme and F.Becker, Allgemeines Lexikon der Bildende Künstier 29(1935), p. 429. In contrast to Dutch 18th and 19th century reference books on painters, the French artist encyclopedia by Mariette (Abécédario (1859) VI, p. 1) makes reference to Van Santen (as an 'excellent enlumincur' who distinguished himself in his profession). 8. The "Carrousel' or, according to its official title, the 'Courses de testes et de bague faite par le roy et des princes' represents an equestrian festivity that was given in 1662 for Louis XIV at the Place du Carrousel in Paris. Louis had this 'faite-book' and a number of others printed in large folio format about 1670, with prints from such artists as Rousselet, Edelinck and Chauveau. 9. See the Uilenbroek library catalogues from 1729, p. 89 no.450; and from 1741, p.28 no.319. The, 1729 auction did not take place. According to Fontaine Verwey, op.cit. (note 2) p.288 n.61, this volume was purchased by Uilenbroek at the Bibliotheca Nicolaiana auction (Amsterdam, 1698). 10. 'Dirck Jansen van Santen, kaartafsetter oudt 37 Jaren after de oude kerk,' Municipal archives of Amsterdam (GAA) Banns record no. 501,180. From 1675 to 1682 they lived on Spiegelgracht, it is believed from the registration of the birth of three children, all of whom died shortly after their birth. In 1682 they again were living near the Oude Kerk (perhaps related to the death of Van Santen's father in 1679). 11. Z.K.von Uffenbach, op.cit. (note 3) pp. 600-606. 12. There will be an exhibition devoted to the Atlas Blaeu-van der Hem very shortly (Royal Palace, Amsterdam, summer 1992). The most extensive treatment of the complete Atlas is K.Ausserer's 'Der Atlas Blaeu der Wiener Nationalbibliothek', Beitrage zur historischen Geographie, Leipzig 1929, pp.1-40. 13. Uffenbach, op.cit. (note 3) p.604; G.J.Hoogewerff, De Twee Reizen van Cosimo de Medici, prins van Toscane, door de Nederlanden, 1919, p.76 ff. 14. He died, as did his widow later, without means, 'onvermogend'; see below. with the colouring of maps and prints were not required to be members, it would seem. Despite the large number of colourists, there is almost no reference to them in the books of the Amsterdam guild. 16. The work that Van Santen could possibly have decorated and that was in the possession of Antiquariat J.Dinter in 1985, Cologne (Cat.3, nos.1,2) is not included in the list of titles from old catalogues and advertisements given at the end of this article. The book in question is [W.Goeree,] Mosaize historic der hebreeuwse kerke, 4 vols., Amsterdam 1700. This antiquarian bookdealer also ascribes the following work to Van Santen: A.Schoonebeeck, Histoire des ordres réIigieux Amsterdam 1695. See also W.K.Gnirrep, op.cit. (note 4), p.64. 17. See below 'Works identified as Van Santen's'. 18. M.M.Kleerkoper and W.P.van Stockum, De Bockhandel te Amsterdam, 2 vols. The Hague 1916, p.1213 ff. 19, There has been some research done into Willem van Beest's background by W.K.Gnirrep, op.cit. (note 4), note 4a and 16a. In his will, (notary Goblet 6-12-1713, NA 7377,1499) there is the note by the 'glaze printe bortjes': 'Bachus-feest afgezet door Jan van Zanten'. The widow was bequeated the 'printboek genaamt Tapisseric du Roy afgezet door Dirk Jansz van Santen' (NA 7377,1503). A copy of the Tapisserie also appears at the March 1714 auction. 20. We only consulted the catalogue of Cromhout's cartographic possessions, not that of his library. Thanks to Mr. Jan van der Waals for bringing this to our attention. See also below : Van Santen's cartographic work'. 21. GAA, not. 3762, pp.415-419. 22. Biblia, dat is de gansche Schrifture..., H. and J. Keur, Dordrecht 1682, UBA BanD4AS. See Fontaine Verwey, op.cit. (note 2), p.224, and 'Works identified as Van Santen's', below. 24. Taken from the auction catalogue for the Bibliotheca Hemmiana, 1684, p.62 ff. 25. Uffenbach, op.cit. (note 3) 111 pp. 600-606. 26. E-Berger, Beitrage zur Entwicklungsgeschichte der Maltechnik, Munich 1901 (reprint 1975), IV,p.297 no.254. 27. Uffenbach, op.cit. (note 3) ill pp. 6oo-606. 28. Fontaine Verwey op.cit. (note 2) p. 223 note 42. 29. For the atlases and Bibles listed here, see below, 'Recovered work by Van Santen'. 32. Ausserer, op.cit. (note 12), p. 3. 33. No research has been done into when exactly the Atlas was given its present form of 46 volumes and 4 supplements. At the time of the Moetjens auction (1730), 14 of the 46 were no longer bound. See also Uffenbach, op.cit. (note 3), p.604. 34. Fontaine Verwey, op.cit. (note 2), pp. 218-219. 35. Auction catalogue Bibliotheca Hemmiana April 18, 1684, Amsterdam, by H. and T.Boom. 36. Fontaine Verwey, op.cit. (note 2), p. 226. 37. Fontaine Verwey, op.cit. (note 2), pp. 225, 226. 38. See Fontaine Verwey, op.cit. (note 2) pp. 219-221; see also below, 'Old references to Van Santen's work', under Magnus. 39. Fontaine Verwey, op.cit. (note 2), pp. 226, 227. 40. See Fontaine Verwey, op.cit. (note 2), pp. 224. He expresses the opinion that all of the notes accompanying the prints were written by Van Santen. This seems unlikely because of the fact that at least four different handwritings can be distinguished. 41. For the compilation of the Bible and the dating of the prints, see W.K.Gnirrep, op.cit (note 4) pp. 57, 58. 42. W.K.Gnirrep, op.cit. (note 4) pp, 52-58. 43. W.K.Gnirrep, op.cit. (note 4) pp. 58-59. 44. W.K.Gnirrep, op.cit. (note 4) pp. 58. 45. A.J.Enschede, Inventaris van het Archief der Stad Haarlem, 1867, p. 61, no. 19. C.Koeman, Atlantes Neerlandici IV, Amsterdam 1970, Loon 9. W.K.Gnirrep, op.cit. (note 4) p. 60. 46. Cf. Fontaine Verwey, op.cit. (note 2), pp. 222, 223. 47. F.W.H.Holstein, Dutch and Flemish Etchings, Engravings and Woodcuts ca. 1450 - 1700, Amsterdam, vol. IX,p.132. nos. 1129-1131, 'Atlas Novus'. 48. W.K.Gnirrep, op.cit. (note 4) pp. 57. 49. Also see in the list which follows below, 'Old references to work by Van Santen', Cartography' under Willem van Beest. 50. The auction catalogues we consulted are found in the library of the Vereeniging ter Bevordering van de Belangen des Boekhandels and the University Library, Amsterdam, aside from Cromhout (Herzog August Ulrichbibliothek, Wolffenbuttel) and Van der Hem 1684 catalogues (National Library, London). The auction advertisements are mentioned in the Amsterdamse Courant. 51. In the Koninklijke Bibliotheek in The Hague (KB) there is a four volume handsomely coloured composite atlas. Each volume contains 100 maps. Its origin has never been researched. Not only Van der Hem but also Willem van Beest possessed a four volume atlas illuminated by Van Santen. 52. See Fontaine Verwey op.cit (note 2) pp. 219-221,. see also 'Work identified as Van Santen's', above, no. 3. 53. See Hem 1684, pp. 66, 67, nos. 22-28, in which a total of 642 Holsteyn drawings of birds, animals and flowers are recorded. Related to nos. 720 and 721 (1730) are nos. 23 depicting 78 water birds and no. 22 depicting 102 birds, respectively. 54. According to Fontaine Verwey, op.cit (note 2), p. 228, Rdver's Caroussel is the same copy as that belonging to the Van der Hem family in 1711. At the 1730 auction (Moetjens, The Hague), however, this volume was the third supplement volume (no. 49) of the Atlas Blaeu-Van der Hem which was sold in its entirety to Prince Eugenius of Savoy. 55. Perhaps Van Santen coloured more work of Antonides van der Goes. Two beautifully coloured copies are known (in the Koninklijke Bibliotheek in The Hague and in a private collection) of his Y-stroom (Amsterdam 1671), bound by Magnus and containing five prints by Romeyn de Hooghe. See Fontaine Verwey, op.cit. (note 2), p.227 and note 59; see also J.Landwehr, Romeyn de Hiooghe (1645-1708) as Book Illustrator, a Bibliography, Amsterdam 1970, No. 9. 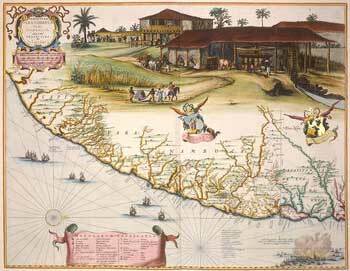 Please contact us if you have an interest in buying maps or atlases coloured by Van Santen.